When I meet folks who are struggling with their former spiritual traditions, I encourage them to reconsider the better points of their childhood faith. Perhaps that’s what I was doing last week when my wife and I flew to Charleston, South Carolina, to visit our grandchildren, and also ended up revisiting the Southern Baptist customs of our childhood. Our revisit began at the First Baptist Church of nearby Walterboro, where my daughter now lives. Inside the church vestibule, a smiling usher greeted us with a bulletin. Like the mimeographed programs of my boyhood, the Walterboro missive told of the upcoming Vacation Bible School and listed the parishioners with June birthdays. Once inside the sanctuary, I looked up at the vaulted ceiling, and I admired the way the stained glass diffused the morning light onto row upon row of burgundy-cushioned pews. I cast an envious look at the pulpit large enough to double as a confession booth, if Baptists were so inclined. Like most first-time church visitors, we settled in a straight-backed pew about halfway toward the front. I leaned forward to inventory the pew racks, which were packed with the usual suspects — offering envelopes, visitor registration cards and hymnals. They were even equipped with the rubber O-rings that Baptist churches have used for decades to soften the clanking sound that empty communion cups can make when returned to uncushioned pews. I was tempted to extract the O-ring and send it bouncing down the pew as I had in my teen years, but the nice usher likely had his eye on me. Two minutes before the service began, folks were still making small talk about the NBA playoffs or the upcoming church picnic. At 11 a.m., though, the glistening organ pipes shushed the congregants, calling the wandering ones back into the pews they’d likely occupied for years. 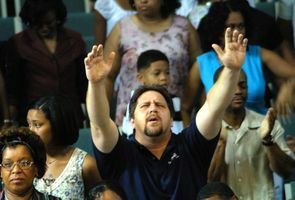 A director in a multicolored shirt stood to lead the congregants in singing “Since Jesus Came Into My Heart.” Two more hymns followed, each one sandwiched between announcements or prayers. After the third verse of the third hymn, the ushers started passing the offering plates. It seemed like a good time to make my second restroom visit, something the Baptist preacher’s daughter I married usually frowns upon. The pastor was on vacation, so a retired minister delivered a three-point sermon in the kindhearted tradition of Southern preaching. No brimstone, just thoughtful points. Twenty minutes later, he began inviting potential converts to leave their pews, walk down the aisle and declare before the congregation their intent to be born again. Now, if you’re wondering why I’d interrupt a visit with grandchildren to find my way into a worship service that lacks today’s evangelical, chorus-singing drumbeat, I believe it was to recapture a moment. It was the moment nearly 50 years ago that I released my grip on the pew and walked toward my “Pastor Dad,” as he stood before his much-smaller Baptist pulpit outside Monterey, California. In a very public declaration of faith, I wrapped my arms around his waist and told Dad that I wanted to follow Jesus. My decision caused my face to hurt with the hurt you get from stifling the tears you know will embarrass you. Yet there was nothing overly dramatic in that moment. No “falling down in the spirit,” nothing mysterious, new age, mystical or magical. It was a simple, quiet knowing that God was in my heart. And thankfully, my visit to Walterboro reminded me not only that God has remained in my heart, but also that when it comes to God, you can always go home again.